Sometimes these feelings arise. I don't have anything profound to say or do in response, other than to let the feelings in, listen to them, and leave the door open so they can leave again. It seems so easy to believe I am not very good at what I do. Nominations, donations, affirmations all sparkle for a moment then (all-too-quickly) fade. The applause dies down, the lights spin round to hold another in their beam. And I am unseen. A colleague chooses your words to speak aloud in a gathering. But friends & colleagues posting the words of any poet but you is all you feel. Congratulations pour in for this achievement, that accomplishment, but the celebration turns to another and somehow cancels out their good opinion of you. She takes the time to read your words, says keep that it's good, says you are doing well; but you come away still wondering, am I writing good words? Is this good enough? This week's musing is taken from Pray the Story, where I am posting prayer-poems for each day of Holy Week. Today: Beloved. in betrayal, who is it? each other as I do. friends in Australia participated in Palm Sunday marches, and as news of violence floods our screens, relentless, I have nothing but my pen. on the underside of the world. silent protests, voting, hoping, hoping. standing on a rock, fighters, for peace. up and we dare you to ignore us. 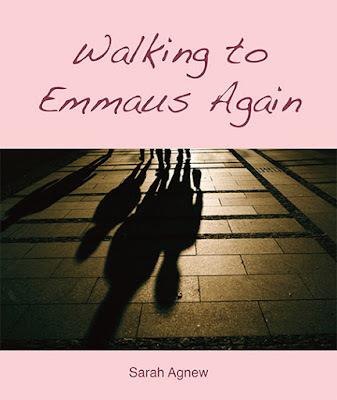 Exciting news – the third of my Holy Week & Easter worship resources, Walking to Emmaus Again, is now available for download from Wild Goose Publications! I enjoyed collaborating with Sandy Boyce and Subtle Bricks actors to create this poetic and dramatic retelling of a well-loved story for Pilgrim Uniting Church, Adelaide, in 2014. I hope you enjoy recreating it in your communities. The season of Lent is reaching its climax. The story of Jesus is reaching its climax. How will you finish the season, how will you enter the story this year? Over on Pray the Story, I will be posting a prayer-poem for each day of Holy Week. For these poetic invitations to pray in response to the story, check in each day, or sign up to receive Pray the Story posts by email. Already available for those planning worship gatherings are prayer-poems for Palm Sunday and Good Friday. Don't forget there are some downloadable (and eminently affordable) resources for Holy Week and Easter through Wild Goose Publications, from me and from others. Follow the tags below for thoughts I've shared here in the past on Holy Week and Easter. And however you enter the story this coming week, may the Spirit inspire you, challenge you, and transform you. Visiting preacher duties again this Sunday past, and revisiting themes of life and death with the story of Lazarus. The story of Dry Bones from Ezekiel was also told, and for the meditation, we heard 'Plan Be' by Bruce Sanguine (If Darwin Prayed). Poetic reflections: from ‘Present on Earth – worship resources on the life of Jesus’, copyright © WGRG, c/o Iona Community, Glasgow, Scotland. www.wildgoose.scot Reproduced by permission. First, let's hear the story, told by my friend Elizabeth Green, on location. We are moving ever closer to death in our Lenten journey through the story of Jesus, approaching the arrest, trial and crucifixion. Your Lenten theme, again, is show us how to live. This week, we ask, how do we live with the hard reality of life that is death? Much on this earth passes away, in the universe, actually, for even stars die, be it so very far from here.